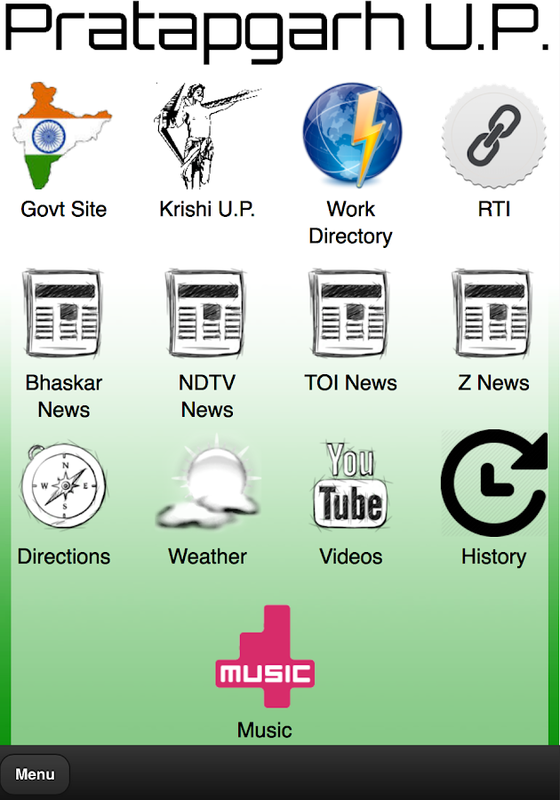 This is an App dedicated to the people of Pratapgarh, UttarPradesh.This app includes:New in Hindi & English multipleprovidersLink to government website giving you latestupdates.Directions to PratapgarhHistory of PratapgarhLink to Rightto information Act WebsiteMade by Bhuvanyu Singh of Bhu1u ElectroPrivate Limited. Born to Yuvraj Jaisingh Sisodia and RajkumariRatna Singh, Bhuvanyu is the prince of two princely states,Pratapgarh in Rajasthan and Kalakankar in UP. Though He was bornand brought up in Delhi he often visited his princely states and isquite familiar with the land, people and culture.He studied at Doon school at Dehra Dun and then graduated with adegree in Political science and economics from Delhi University. Healso completed the certified course for real estate agents and homeloan agents. During the holidays he'd often come to help hismother, Rajkumari Ratna Singh in her constituency.After graduation he started his own security agency. Itspecialises in VVIP security and provides tactical and combattraining, security consultation, auditing, security andsurveillance equipment throughout India.Pratapgarh being a agrarian district, taught Bhuvanyu a lotabout agriculture in India and he's the director of Bhumishree Farmand Farming products. It's food processing and packaging unitprepares local food for sale.He's also the director of Bhu1u Electro Pvt Ltd, which dealswith the import, export, assembly and retail of electronics and heis a Director in Nexgen facility management , that specialises inweb designing, software and app development as well cybersecurity.But while he is an adept businessman his true passion is socialwork. Having grown up so close to the people Bhuvanyu is extremelyempathetic towards their needs and eager to help them. He does sothrough his NGOs. He's a director of KKRF and the founder ofiGive.He has distributed solar lights to areas with little to noelectricity, provided assistive equipment to physically disabledpeople, held training camps and so on through KalakankerFoundation. For further information, click here to visit theofficial site.Through iGive he has developed electromagnetic patches to stickon electronics, such as mobile phones, tablets and laptops, whichabsorb 33% of the harmful radiation the give out. The profits fromthe sale of these will sponsor a camp to provide the hepatitisvaccine to rural children.He also believes that education is of utmost importance for longterm rural development and is in the board of two school, threecolleges and is the chairmanship of a Girls Degree College.He's an aspiring politician, very active in the UP politicalscene and through all his benevolent behaviour and generosity isalready loved by the people. They know he is approachable andhelpful and have no qualms about approaching him with any sort ofproblem for help.On a personal level he enjoys, music, photography, shooting, RCflying, travelling and is interested in electronics and cars; he isskilled with technology. He divides his time between handling hisbusinesses in Delhi and politics in Pratapgarh.Made by Bhuvanyu Singh of Bhu1u Electro Private Limited. A an app dedicated to the people of Pratapgarh for publicinteraction and many more features likeRegional WallPostChatLocationNewsWeatherCalenderMusicShoppingContactEtcMade byBhuvanyu Singh of Bhu1u Electro Private Limited. This app includes:New in Hindi & English multiple providersLinkto government website giving you latest updates.Directions toPratapgarhHistory of PratapgarhLink to Right to information ActWebsiteMade by Bhuvanyu Singh and Abhishek Sehgal of Bhu1u ElectroPrivate Limited. An app to view and explore almost everything about sikhreligion.Not for just sikhism, but our app delivers many peace ofmind facilities to every human either men or women or anyone whowants to being in touch with god but couldn`t find a way to reachthere.It`s an app to enjoy travelling at various holy place withjust one click.Developed by Bhuvanyu Singh and Abhishek SehgalAppFeatures:1: Listen to gurbani and shabads online or downloadalso.2: Listen To all Path`s with your favorite Raagi`s voice.3:Read All the Guthke, Nitnem and other holy books on sikhismreligion in Gurmukhi or Hinglish.4: Watch Live Samagams and pastrecorded samagams at very low data usage.5: Read all news aboutsikhism religion and related news.6: Watch all videos of gurbaniKirtan and shabads with searching your favorite raagi`s.7: Read allHistory of Sikhism and know all their Religion aspects.8: Getdirections for the various gurudwara`s in delhi and the maingurudwara`s where one of the 10 sikh gurus had arrived.9: Travelall the gurudwaras of the world.10: Read and View Images of all theGurudwara`s of the world.Whats new: 1: Reading material like guthkeand baani`s and GG.Sahib in english is added.2: Directions andLocations are improved with more accuracy.3: More Gurudwara`sTravelling pages are added with their pictures and histories.4:Bugs fixes.5: Screen Cuts and icons displacements are properlyfixed. Uttar Pradesh Government has launched the mobile App forregistering citizen's grievances/suggestions. The Mobile App islinked to the Jansunwai(IGRS) portal of Uttar Pradesh Government,where grievances/suggestions can also be registered through Web(jansunwai.up.nic.in). A fast and user-friendly interface has beenprovided for registering and tracking of grievance through mobilephones. Each Grievance will be provided a unique Reference number.Citizen can use this reference number to track progress ofgrievances, send reminder & also for giving feedback afterdisposal. After successful registration, the reference will beautomatically forwarded to the concerned officer for redressal. Uttar Pradesh Land Record :- View,Save,Print and Share :- 1)Bhulekh 2) IMPORTANT SERVICE STATUS ADHARCARD,PANCARD,PASSPORT ANDTRAIN ENQUIRY Notes :- 1) The land record provided here is only forgeneral information. 2)If you want original copy ,Please contactyour goverment office. We are proud to introduce a brand new update of our NepaliDictionary app with advanced levels dictionary. In this update, wefocused on accuracy, ease of use, and tools to help our users toimprove their English language proficiency. This app includes twodictionaries - English-English-Nepali Dictionary and Nepali-EnglishDictionary. Both of these are based on highly cited books authoredby Choodamani Gautam. Main Features1) Comprehensive Word List -Wehave included more than 20,000 English word meaning and 30,000Nepali word meaning including advanced level words.2) Completelyoffline - We have included our entire dictionary inside the app, sothat our users can use it even if they don't have internet access.We also provided way for the users to update the dictionaryover-the-air once they have internet connectin.3)Both-way-Dictionary - We have included two dictionaries -English-to-Nepali and Nepali-to-English so that this app is usefulto users who are learning Nepali as well.4) Learning WordPronunciations - This app will help users learning how to correctlypronounce words. For example, many Nepali pronounce "Potato" as"पोटेटो", but correct pronunciation is "पटे(इ)टो" 5) Image andIllustration This dictionary includes images of words in importantcategories like vegetables, animals, fruits etc. 6) Word Games - Wehave included many word games that helps our users to improve theirlanguage learning. १० लाख भन्दा बढी डाउनलोड भइसकेको यो "हाम्रोनेपाली-English Dictionary" app सन् २०१६ मा प्रथम पटक सार्वजनिकभएसँगै हाल यसलाई दैनिक लाखौँ प्रयोगकर्ताहरूले नियमित साथ दिँदैआइरहनुभएको छ । एण्ड्रोइड मोबाइलमा एकपटक डाउनलोड गरिसकेपछि प्रयोगगर्न इन्टरनेट नचाहिने यो नेपालकै पहिलो Offline Dictionary app हो ।नेपाली शब्दका अंग्रेजी अर्थ अथवा अंग्रेजी शब्दका नेपाली अर्थ हेर्न,बुझ्न, सिक्न र उच्चारण सुन्न मोबाइलमा यसअघि अन्य विकल्प थिएनन् ।पहिलो संस्करण कक्षा १० सम्मका स्कूले विद्यार्थीहरूमा उपयोगी हुनेखालका सीमित शब्दहरू राखेर सार्वजनिक गरिएको थियो । आज सार्वजनिक यसनयाँ संस्करण भने झन् तीक्ष्ण भएर नेपाली तथा अंग्रेजीका प्रशस्तशब्दहरूसहित Play Store मा उपलब्ध छ । स्कूले तहबाट माथि उठेर अब यो"हाम्रो नेपाली-English Dictionary" app क्याम्पस तहमा पुगेको छअर्थात् अब यसले Advanced शब्दहरू पनि देखाउनेछ, व्याख्या गर्नेछ,तस्वीर देखाउँदै शुद्ध उच्चारण पनि गरिदिनेछ ।नेपाली अक्षरमा,व्याकरणमा तथा समग्रमा नेपाली भाषामा अतुलनीय योगदान दिँदै पुराना तथानयाँ नेपाली पुस्तालाई भाषाको गरिमासँग निरन्तर जोड्न सफल वरिष्ठव्याकरणकार, कोशकार तथा भाषाविद् समादरणीय श्री चूडामणि गौतमज्यूले योहाम्रो "हाम्रो नेपाली-English Dictionary" app को नयाँ संस्करणकालागि ३० हजार बढी नेपाली शब्द तथा २२ हजार बढी अंग्रेजी शब्दहरूउपलब्ध गराउनुभएको छ । परापूर्वकालदेखि नेपाली भाषामा प्रयोग भएकाशब्दहरूदेखि नयाँ पुस्ताबीच बोलीचाली तथा, चलनचल्तीका शब्दहरू पनियसमा समेटिएका छन् । नेपाली सिक्नका लागि नेपाली भाषाका सरल र दैनिकबोलीचालीमा प्रयोग हुने वाक्यहरू (उच्चारण र अंग्रेजी अर्थसहित) यसकामुख्य विशेषताहरू हुन् । नेपाली शब्द र त्यस शब्दको सरल व्याख्यासँगैअंग्रेजी अर्थहरू देश तथा विदेशमा रहनुहुने नेपाली–समाजका नयाँ,पुराना तथा भावी पुस्ताबीच जोगाइराख्नुका साथै प्रचार–प्रसार गर्नेउद्देश्यका साथ हाम्रो प्रविधिले श्री चूडामणि गौतमज्यूसँग शब्दकालागि सहकार्य गरेको हो ।थप विशेषतायूक्तःअसंख्य शब्दहरूः ३० हजारनेपाली तथा २२ हजार बढी अंग्रेजी शब्दहरूतस्वीरः शब्दसंग सम्बन्धिततस्वीरहरू सहित (इन्टरनेट आवश्यक)अडियो उच्चारणः अंग्रेजी तथा नेपालीशब्द कसरी बोल्ने सोको अडियो उच्चारण (Pronunciation)अफलाइनःDictionary प्रयोग गर्न, शब्दहरू खोज्न इन्टरनेट नचाहिनेखोज्नेः सजिलैSearch मा गएर आवश्यक नेपाली, अंग्रेजी शब्द खोज्न सकिनेकृपया हाम्रोयो नयाँ संस्करण हजूरहरूलार्इ कस्तो लाग्यो प्रतिक्रियाकालागि सिधैPlay Store मा कमेण्ट गर्न सक्नुहुनेछ अथवा इमेलकालागि[email protected] मा हामीलार्इ लेख्नुहोस्, हजूरहरूको सल्लाह,सुझाव तथा प्रतिक्रिया हाम्रोलागि उर्जा बन्नेछ । धन्यवाद ! Quotes in Hindi is an application which gives you minded inspiringquotes that will change your day and feel you to do well and teachyou new lesson like this quote - "समय दिखाई नहीं देता, पर बहुत कुछदिखा जाता है !!" Quotes in Hindi app include following types offabulous quotes : - Motivational Quotes in Hindi (Motivate yourself) - Hindi Suvichar and Quotes (lets update your status) -Positive Quotes Now read you favorite Quotes in Hindi language andshare with friends you can copy quotes and can paste it to whereyou want. 'Sukhmani Sahib Audio' path app let you read and listen to paath onyour mobile. You can read 'Sukhmani Sahib Path' 'in Hindi'', 'inPunjabi' or 'in English' and can read 'meaning of path' whilereading or listening to 'Sukhmani Sahib Path'. Purpose of this appis to let busy and mobile young generation reconnect with Sikhismand Gurubani by reading path on mobile. We hope that you will findthis app useful and and will use it daily. 'Sukhmani Sahib Path'app - key features: - # Select language of your preference:-'Sukhmani Sahib in Hindi' or 'Sukhmani Sahib in Punjabi' (Gurmukhi)or 'Sukhmani Sahib in English' # Listen to 'Sukhmani Sahib Audio':- - Seek bar to control audio - move back and forward - Pausebutton will stop audio and let you play path from where you left inlast session - Stop button will stop path completely. If you playagain, path will start from current page - Go to currently playingashtapadee (in Settings >> Audio) - You can go to page ofyour choice using GO button on top-right corner # Select from 5themes - Sepia, Classic, White, Black, Silver # Select text sizesof your choice # Read meaning of each page using Translate option #Rate and provide your feedback using Feedback option # Read inportrait or landscape mode # All controls are 'in English' #'Sukhmani Sahib Audio with Lyrics' Ads: - # Please note that thisapp is ad supported # We show ad in non-intrusive manner so as tonot to disturb you during path About 'Sukhmani Sahib Path' Ji: -Shri 'Sukhmani Sahib' is the name given to the set of hymns/ path/paath divided into 24 sections which appear in the Sri Guru GranthSahib, the Sikh Holy Scriptures on page 262. Each section ofSukhmani Sahib, which is called an Ashtpadi(asht means 8), consistsof 8 hymns per Ashtpadi. The word Sukhmani literally means Peace inyour mind. This set of Hymns or Bani is very popular among theSikhs, who frequently recite it in their places of worship calledGurdwaras and at home. The full recital takes about 90 minutes andis normally undertaken by everyone in the congregation. Accordingto Sikh doctrine, this Bani is believed to bring peace to one'smind and compoundly peace to the world. This set of 192 hymns werecompiled by the fifth Sikh Guru, Guru Arjan Dev Ji. Free Language TranslatorText translator free, easy to use andfast.Ideal for mobile phone or tablet. This application translateinto and from more than 100 different languages and pronounce thewords written for better understanding.Enter the text you want totranslate writing or speaking. The application can translate yourvoice.While its main use is the translation of english into spanishand vice versa, you can do many translations in languages such asEnglish/portuguese, English/French, English/Italian, English/German, etc.The use of this application is completely free butrequires an internet connection (3G, 4G, LTE, Wi-fi) to connect tothe translation server. Once translated the phrase for the firsttime, it will keep it in the memory to access it offline.Thelanguages currently supported are: (ar) Arabic, (bs) Bosnian, (bg)Bulgarian, (ca) Catalan, (zh-CHS) Chinese Simplified, (zh-CHT),Chinese Traditional, (hr) Croatian, (cs) Czech, (da) Danish, (nl)Dutch, (en) English, (et) Estonian, (fi) Finnish, (fr) French, (de)German, (el) Greek, (ht) Haitian Creole, (he) Hebrew, (hi) Hindi,(mww) Hmong Daw, (hu) Hungarian, (id) Indonesian, (it) Italian,(ja) Japanese, (ko) Korean, (lv) Latvian, (lt) Lithuanian, (ms)Malay, (mt) Maltese, (no) Norwegian, (fa) Persian, (pl) Polish,(pt) Portuguese, (ro) Romanian, (ru) Russian, (sr-Cyrl) Serbian(Cyrillic), (sr-Latn) Serbian (Latin), (sk) Slovak, (sl) Slovenian,(es) Spanish, (sv) Swedish, (th) Thai, (tr) Turkish, (uk)Ukrainian, (ur) Urdu, (vi) Vietnamese, (cy) Welsh, (yua) YucatecMayaShare your translations through social networks (Facebook,Twitter, WhatsApp, Instagram) or SMS, Bluetooth, Email orWi-Fi.This application is similar to the google translator or thebing translator, but optimized for use in cell phones or tablets.Ifthe translator is to your liking and utility, please qualifypositively to continue improving it. Your comments are veryimportant to us as they can improve our application.Thank you verymuch for using our translator!Please excuse any inconvenience theuse of advertising may cause to you, but it’s the only way to keepthe product running, as translation costs are very high.Note: thissystem uses the translation engine of Bing Translator or Googletranslator for consultations and requires an internet connection tofunction properly.